Haywood Habitat supporters gathered in Waynesville on September 24th for an official groundbreaking ceremony for Walton Woods, the affiliate's first neighborhood. Walton Woods will be developed on property on Davis Cove Road donated by Sarah Jane League and Gary Smith. Eight homes will be built on the property, Haywood Habitat's most ambitious undertaking in its 26 year history. 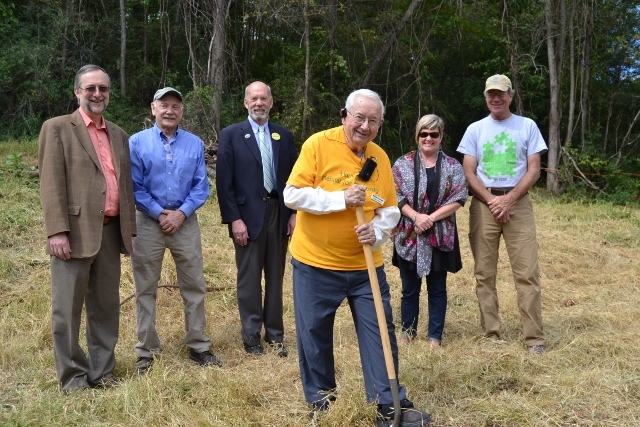 Walton Woods is named after Walton Garrett, who started the organization in 1990, and who, at age 89, has worked on each of the 52 homes that have been built since that time. Site preparation will begin in early fall, and construction of the first two homes is scheduled for January 2016.